Your Brivity Platform becomes much more powerful as it automatically engages prospects to keep coming back to your site, helping to build a relationship with you and your team before you've even met! Setting up Listing Alerts is one way to draw prospective Buyers back to your site by alerting them of new properties that fit their search perimeters as they hit the market. Step 1: Open up a contact record and click on the Listing Alerts tab. 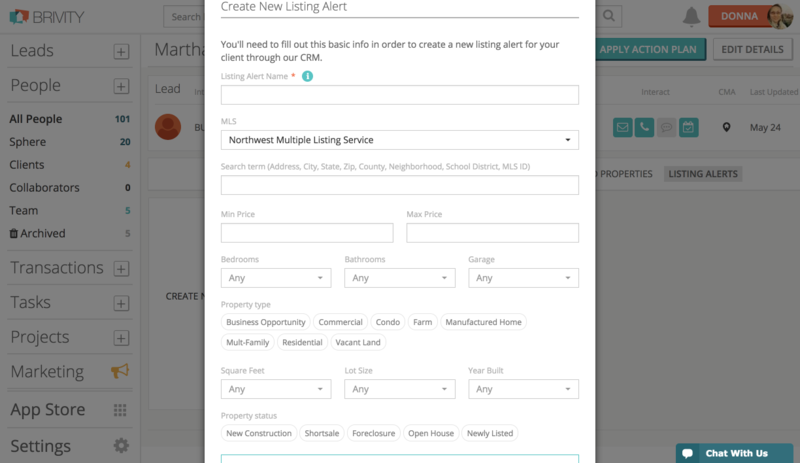 Step 2: Click Create New Listing Alert. Step 3: In the pop-up, add the Buyer's search criteria, and click Save. Step 4: Click to see number of matching listing results at the bottom. *Note: If there are no listings that fit that criteria, your lead will not receive an immediate email.